Several wonderful Pissarro paintings are available in the Spring sales of Impressionist paintings in New York City this year. 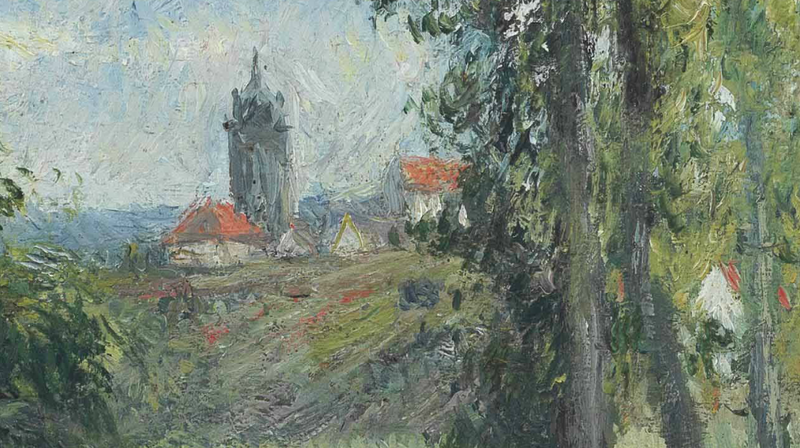 This one, “Landscape at Pontoise,” will be offered in the Day Sale on May 15, 2015 at Christie’s. It will be especially exciting to see it in person since the Pissarro catalogue raisonné (2005) contains only a black-and-white photograph. The provenance provided by Christie’s does not list any exhibitions, so it probably has not been on view for a long time. It is a vertical painting, generally considered an unusual choice for a landscape. At that time, most artists used horizontal canvases that would give them plenty of room on each side of their focal point. This painting is also tiny, only 16 1/8 x 13 inches, a little treasure. 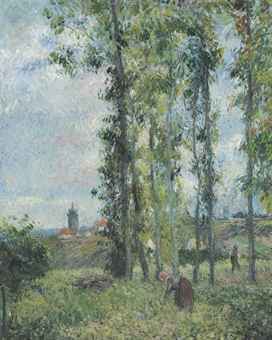 Pissarro uses more than half the canvas for a thick screen of tall poplar trees which prevents us from seeing the village of Pontoise in the distance. All we get is a narrow space through which we see the steeple of the church of Saint-Maclou, now a cathedral, and a couple of red roofs. Even in this close-up, the church steeple is indistinct and though our eyes are drawn to it, it is obviously not a the most important element (focal point) in the painting. In the foreground, we see a woman bending over and a man in the distance. As we know, many of Pissarro’s paintings have no particular focal point–no large or important element that dominates the view. In this one, both the woman and man are mere sketches rendered in a few brushstrokes and hardly large enough to be important. Though the trees dominate the painting, they have no real importance–all they do is prevent us from seeing what is beyond. 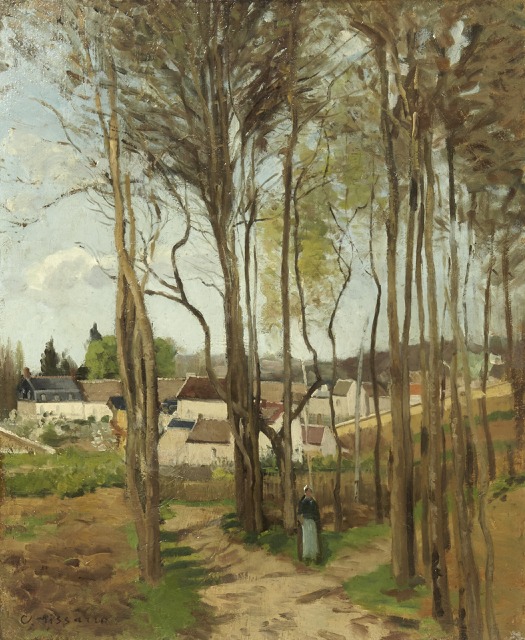 Pissarro developed this device about ten years earlier in his 1869 painting, “The Village Screened by Trees.” According to the catalogue raisonné, that was the first time that he used this screening device. We see trees used in similar ways in the paintings of Corot, with whom Pissarro had painted as a young man. But Corot’s paintings always had a focal point, and his trees were never as thick and as dominant as those in Pissarro’s screens. Pissarro continued to use this compositional device throughout his career. Because this painting has no real focal point, we are forced to look at the painting literally as paint on canvas and enjoy the energy and movement of Pissarro’s brushstrokes. Pissarro is painting in a way that was still very new for that time. He made this painting in 1879, the year of the Fourth Impressionist Exhibition. The art establishment of that time continued to favor paintings in which brushstrokes were invisible and the surface of the painting was smooth. Pissarro is, once again, defying the accepted practice. 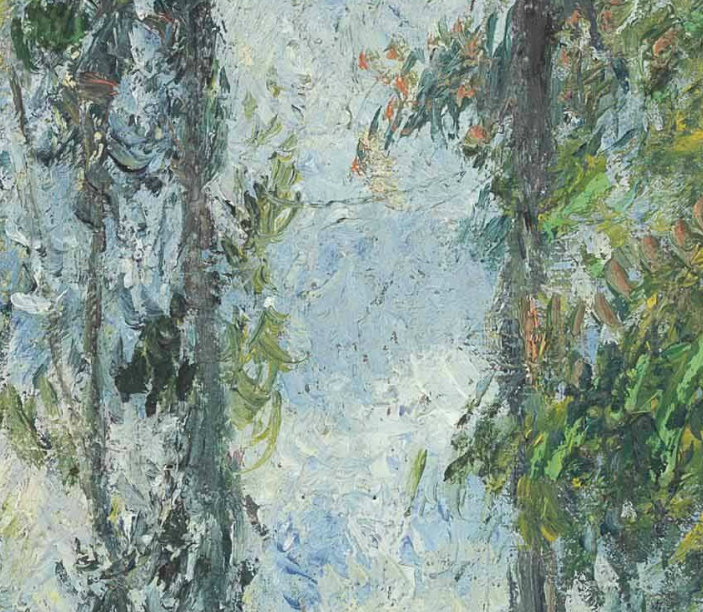 Seen up close, it looks like he was applying the paint with wild abandonment–stabs of blue and white in the sky and green and dark green for the trees. A faint touch of light red among the green gives it even more brilliance. This view of Pontoise from the nearby village of Ennery was lovely on a sunny day, but Pissarro was not interested in giving us a photographic reproduction. If all we see is the location, then we have missed the point. 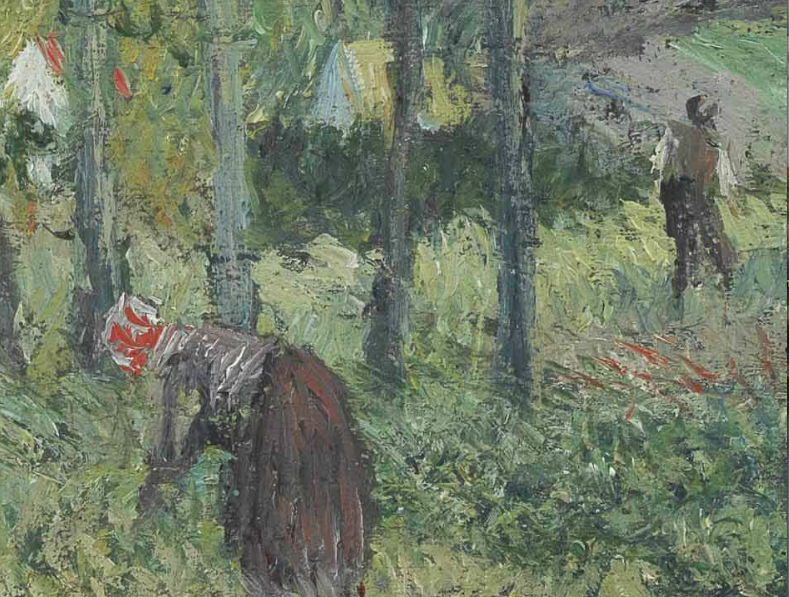 Pissarro used this view to provide an engaging design for putting paint on canvas.